Okay, maybe I have gotten a bit dramatic with this title. But, you HAVE to try making your own cereal. Snack Girl has featured a DIY (do-it-yourself) cereal recipe before see: DIY Cereal For A Healthy Snack. But, I found an even BETTER idea, because it is easier. This idea came from Martha Rose Shulman and her wonderful book, "The Very Best Recipes For Health". The book includes a recipe for muesli, which is a Swiss breakfast cereal. Martha tried muesli when she was a teenager at a friend's house. She says that "from then on it was the only cold cereal I wanted to eat". Amen, sister. The taste is SO much better than a box of prepared cereal. All you have to do is get some quick-cooking oats (not instant) and some almonds or sunflower seeds and toast them in the oven for 8 to 10 minutes. Then, it will store for several weeks in the refrigerator. I didn't have instant oats at home, so (with Martha's blessing) I decided to just pulse my whole oats in the food processor until they were shredded. Then, I chopped my almonds in the processor because I didn't have chopped almonds either! The entire process took about 15 minutes and I have this wonderful tasting cereal ready to go whenever I want it. 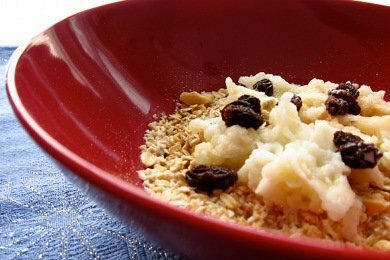 I added her suggestion of grated apple and raisins and milk, but it would be great with any fresh fruit and yogurt, too. As for the book, you can get a sample of Martha's recipes on the Well Blog: Tara Parker-Pope on Health every Friday. Last Friday, she featured vegetable hash (which looked divine). Check her out! She will inspire you to eat all sorts of new foods. Have you tried to make your own cereal? Please share! 1. Preheat the oven to 375F. Stir together the oatmeal and chopped almonds or sunflower seeds in a medium bowl. Line a baking sheet with parchment and spread the muesli on top in an even layer. Bake for 8 to 10 minutes, until very lightly toasted. 2. Remove the baking sheet from the oven and transfer the muesli to a bowl. (At this point it can be stored.) To serve, add the apple and dried fruit, moisten with milk, and add brown sugar or honey (if using). Stir to combine. ADVANCE PREPARATION: The oatmeal and nuts can be toasted and will keep for serval weeks in the refrigerator. Add any fresh fruit just before serving. Yum! Thanks so much for this great recipe. I have become a huge fan of the steel cut oats (with flax seed, cinnamon, and wheat bran added) cooked in the rice cooker. Set that snazzy machine up with the time, and wa-la, delicious hot cereal ready for you the minute you enter the kitchen in the morning. Love this! On another topic: I read on your site about the new WW and how the new point system allows you not to count fruit or vegetables...? How is that possible? Can't you eat too much fruit? Is there a limit? Thanks!